Power is measured at the wheels on our Mustang 500 SE AWD dyno in a controlled environment for accuracy. Dyno runs shown are the average runs of a 10 run sample group for both the Baseline and [EVOMSit] modified runs. 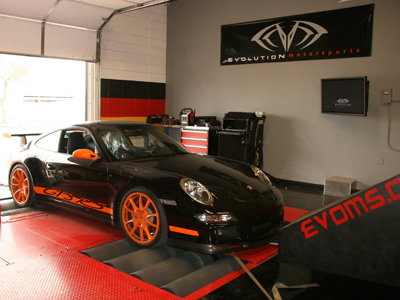 Dyno runs are accurately run with the same RPM start point, same transmission gear, same performance mode (sport or non-sport) and same cool down time in-between runs. Measurement was made with 1 x 65,000 CFM main cooling fan in the front of the vehicle with 2 x 5000 CFM “spot” cooling fans directed down the rear window. 1 x additional 45,000 CFM fan in the rear of the vehicle forcing fresh air into the rear engine compartment. Rear decklid was closed to simulate actual air flow into the engine compartment. Dyno room temperature was 84.5 degrees Fahrenheit for both sets of run groups and fuel grade was 100% pump 91 octane AZ grade oxygenated fuel.